Which Chord Next? A Simple Approach to Chord Progressions. Planning to get a diploma in music soon? Are you checking out audio production courses and music production courses in Melbourne now? Several articles such as this one have been prepared to refresh your knowledge in music. Read on to familiarise yourself with music theory and prepare yourself for an Advanced Diploma in Music Industry available at Abbey Road Institute Melbourne. Have you ever sat down and come up with a great sounding chord progression or riff, but then not known what to do next? Perhaps you tried pairing two similar sounding chord progressions together to establish a Verse / Chorus in your song, but the two sections just don’t work well together. This might leave you feeling frustrated and wondering exactly how your favourite artists compose their tracks, and if you’ll ever be able to do it yourself. Because there are many different compositional techniques and approaches that artists use to create their tracks, in this article we will focus on the most simple technique of establishing diatonic chords (or diatonic harmony) to allow you to utilise some time tested chord progressions and start piecing your song together section by section. While this diagram might initially be overwhelming (particularly if you are not comfortable identifying notes on the staff), following a few simple rules and guidelines will help you uncover the great benefit that the Circle of Fifths provides musicians. Say you wanted to compose a chord progression in the key of A Major. 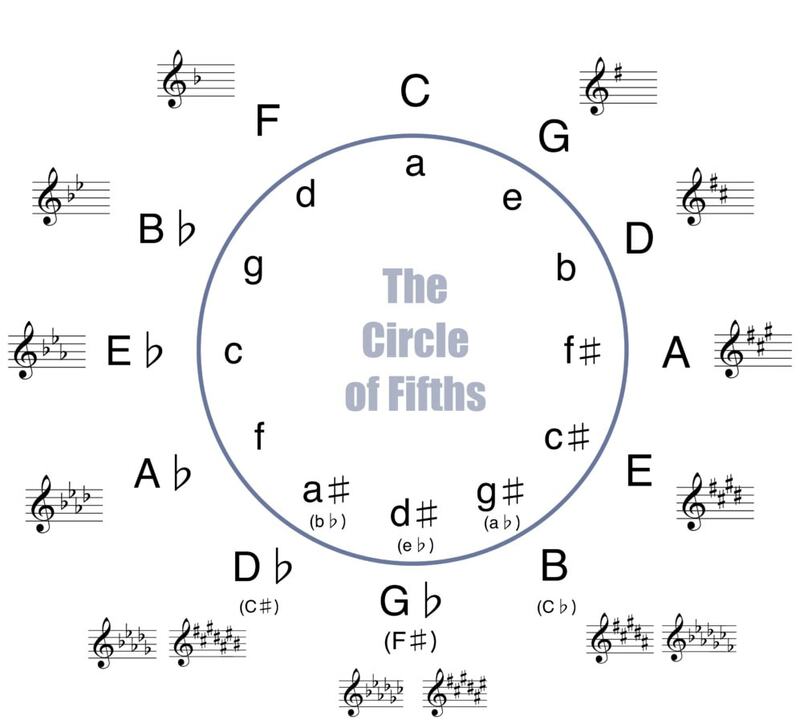 You can simply refer to the Circle of Fifths to find A Major (positioned at 3 o’clock) and see that it indicates that A Major has 3 sharps present in its Key Signature (a shorthand representation of the altered notes within that key). Now without even being able to identify the note positions on the treble clef, I will show you a simple way to remember the ordering of all the sharps in a Key Signature. As everything in music theory relates back to the Major Scale, by now knowing how to establish all the notes in each Major Scale you effectively know about 80% of what is required to compose simple, stable sounding chord progressions. Now we are free to sequence any one of these 7 chords available to us in any order that we wish and our chord progression will maintain a sense of tonal centre as all the chords are diatonic to the key of A Major. Better yet, we can utlise the dozens of time-tested chord progressions that artists have used throughout the ages, to come up with distinct progressions for each section of our song. A simple Google search for “Common Chord Progressions” will yield a multitude of pages describing different applications of this concept. As all of these chords are diatonic (natural) to the key of A Major, it means each section will work together and your song will progress nicely with no harsh transitions. Above all, it will also mean that you have a strong, stable foundation for your song allowing you to easily build melodies, harmonies and instrumentation on top of these progressions. Feel free to experiment with the rhythm and timing of each chord progression, also feel free to alter some of the chord qualities to create a little more interest in your piece. 3. Choose a common chord progression for each section, and apply the chords you have identified in your Major Scale to that progression. And that wraps up the interesting discussion on chord progressions. If you are interested in sound engineering or music engineering, stay tuned for more articles.